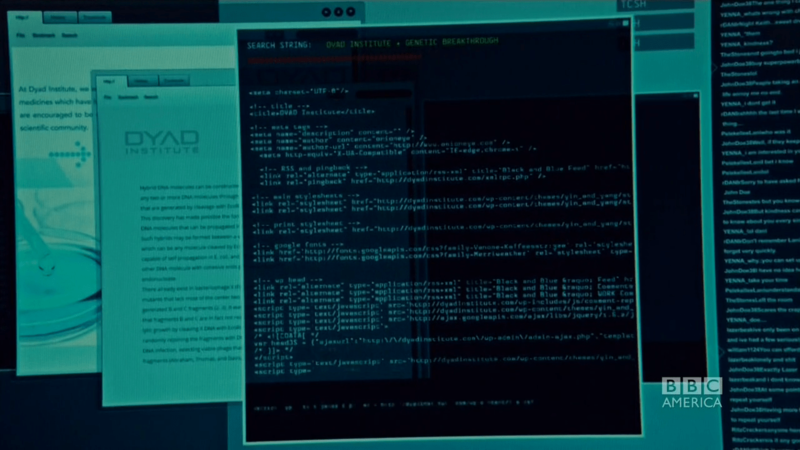 In the latest episode of the great TV show Orphan Black, a character is searching for something on the Internet and is for some reason viewing search results in the form of HTML (ooo, what a hacker!). If you look at the stylesheet URLs, you’ll notice “wp-content”, a sign that it’s a WordPress-powered site! Before you bother to check, the domain is registered in real life but there’s no site there, WordPress or otherwise. For other sightings of WordPress on television, check out these posts. This entry was posted in Television, WordPress and tagged BBC America, Orphan Black, Television, WordPress, WordPress On TV. Bookmark the permalink. The site is named “Black and Blue” and appears to be running the Yin & Yang theme from Onion Eye Themes. Given that that is a portfolio theme, I’m guessing it’s one of the cast members pages that they just modified quickly or something similar.